Like Kant, the German Idealists, and many neo-Kantian philosophers before him, Nietzsche was persistently concerned with metaphysical questions about the nature of objects. His texts often address questions concerning the existence and non-existence of objects, the relation of objects to human minds, and how different views of objects impact commitments in many areas of philosophy—not just metaphysics, but also language, epistemology, science, logic and mathematics, and even ethics. 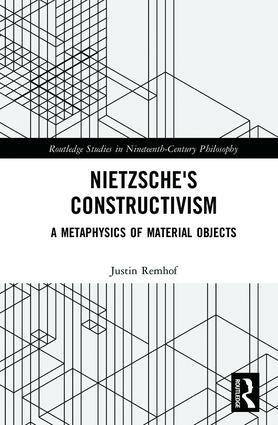 In this book, Remhof presents a systematic and comprehensive analysis of Nietzsche’s material object metaphysics. He argues that Nietzsche embraces the controversial constructivist view that all concrete objects are socially constructed. Reading Nietzsche as a constructivist, Remhof contends, provides fresh insight into Nietzsche’s views on truth, science, naturalism, and nihilism. The book also investigates how Nietzsche’s view of objects compares with views offered by influential American pragmatists and explores the implications of Nietzsche’s constructivism for debates in contemporary material object metaphysics. Nietzsche’s Constructivism is a highly original and timely contribution to the steadily growing literature on Nietzsche’s thought. Justin Remhof is Assistant Professor of Philosophy at Old Dominion University. He specializes in Nineteenth and Twentieth Century European Philosophy and Metaphysics. His work has appeared in journals that include European Journal of Philosophy, History of Philosophy Quarterly, Journal of Nietzsche Studies, and Nietzsche-Studien.